The Daily Office has its roots in the early monastic tradition when it was considered the duty, the officium, of the monks to pray daily for the whole church. In time the daily rhythm of prayer developed into seven periods of praying using the Psalms and other scriptures. The Church of England simplified the Office to Morning and Evening Prayer, which became the regular pattern for Sunday worship, though at its inception the idea of morning and evening prayer was for a daily practice not just Sunday. The liturgical movement of the late 1960s onwards, together with a new interest in monasticism, has prompted the publication of a number of office books to help the faithful pray in a daily pattern. All the Offices contain prayers for the days of the week in a regular cycle. Most revolve around the church year of Advent, Christmas and Epiphany, Lent, Easter, Ascension and Pentecost. This pattern helps prayer and reading focus on the events of the life of Christ. The Office also gives participants a sense of sharing in the worship life of the whole church throughout the world. A Way of Living (Ithaca, NY: ICM, Inc, 1998,1999,2001, 2005). The office of our community. David Adam, The Rhythm of Life: Daily Celtic Prayer (London: SPCK, Harrisburg PA: Morehouse, 1996). A useful resource of daily prayer. An excellent complementary book to the above. 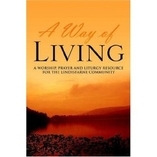 Common Worship: Daily Prayer (London: Church House Publishing, 2002). The Church of England’s new Daily Office. This is a provisional publication, being used as a “test drive” by parishioners before a final edition is produced in 2004. The book contains a wealth of resources for use at different periods in the church’s calendar. Contemporary Office Book (New York: Church Hymnal Corp., 1995). The Episcopal Church USA. This excellent book has the readings in full for the daily lectionary (the same lectionary as in the Lindisfarne A Way of Living). The Office used by the Society of St. Francis. A great resource of saints' days and festivals. Celtic Prayer from Iona (Mahweh, NJ: Paulist Press, 1997). Celtic Daily Prayer (London: Marshall Pickering, 1994, 2001). Daily prayers and meditations from the Northumbria Community. A wonderful source book of Celtic stories and emphases. The prayer book of the Lindisfarne Community.